Black Outback: Saw you at Towners getting gas on Ash. You came over and startled me and then said how beautiful my black Outback looked. Yours was dirty from the winter. I wanted to say not half as beautiful as you, but was too taken aback by your friendliness. After gas, I was heading for coffee. Care to join me sometime? Kindness on the Corner: I saw you at 7-11 on Saturday, picking up two pizzas and grabbing treats with your friends. You held the door for others and managed to carry your food out successfully. I admire you and your kindness. Passport line: Cheers to the wonderful people who let me cut the passport line at the Garland Street Post Office on March 16. I almost fainted when after waiting in line for 2 1/2 hours all of you cheered and clapped me to the front of the line! What a memorable event! Thank you to the Greeting Card Man with his sweet wife and young son who alerted the post office staff to my "photo only" cause. Instead of impatience, he chatted amiably in line while selecting greeting cards he'd send to his wife and friends — thinking of others not himself. Thank you to the Mother of the Year who stood in line for her 16 year-old-daughter, delighting in sharing cellphone photos of the eclipse rather than complaining about a Saturday morning spent in line at the post office rather than Starbucks. Thank you to all the people who were ahead of me. Thank you Garland Street Post Office for working so hard to try to accommodate so many Saturday customers. I learned a lesson in patience and kindness. Cheers and Jeers for Browne's Addition: Yeah! Browne's Addition neighbors getting out and enjoying the start of Spring. Boo! Dog owners who aren't doing the right thing and picking up after their dogs. It's gross and it's bad for the environment and the river. Be respectful of your neighbors and your neighborhood. Print Media Lives! 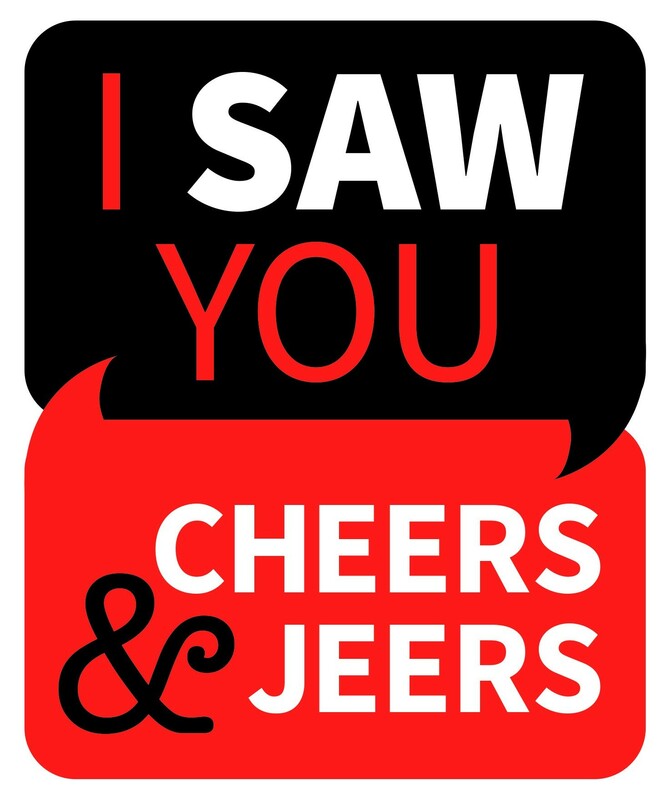 : Cheers to the 'What the Heck' Jeers of March 21. It elicited no fewer than four published (and hark! who knows how many unpublished) indignations. We are glad to know that trolling is alive and well in print media. Here we thought it required social media to win an election! All we need is a well placed Jeers. Ergo...cheers! Great Service: I wanted to send a huge THANK YOU to all of the Zip's locations! 7 years and you have never made my order wrong! Your staff is always fast and friendly! I appreciate what you do in our community! Birthday Crew: Thank you to Sarah, Doug, Sean and the double Daniels for making my "last birthday party" one to remember. It was nice to have the time out as an adult and to be able to enjoy thing I love with the people I love. Goo Goo Dolls: I love remembering when you played that Goo Goo Dolls song for me — and those lyrics, just like our odyssey, will always be unforgettable: "I twist my fate just to feel you, and you, You turn me toward the light, and you're one with me, will you run with me?" Hey the GGD are playing No-Q on June 9th! It's Spring again, reminding me how I miss you, and how we fell "Accidentally In Love..." And when the birds around you do magical, wondrous things, it's Spirit's way of reminding you of me... and "If you're a bird, I'm a bird..."
Jeers to us: Whether or not you believe climate change is real, we've got a real problem Spokane. Some friends and I visited the river last week and we were shocked to see the amount of garbage all around us. It doesn't take much to make a huge difference. Let's try to make our city a cleaner and more beautiful place. I invite you to please consider taking your own reusable bags to the grocery store. Separate your trash from your recycling, carry a reusable water bottle, and take your reusable coffee cup when you go to Starbucks (and save some money while you're at it too). And for the love of god please stop throwing trash out of your windows while you're driving. Burger King shame: Shame on a manager at a local Burger King. On 3/25 a group of middle school band students came in after doing a concert. They ordered food and after they ordered you told them it would be a 20 minute wait when they explained their bus was leaving before that and asked for their money back. Not only did they not get their food you wouldn't even refund their money. The poor night manager has had to try and clean up your mess by offering food vouchers. The school and or band director offered to reimburse the students. I hope if you have kids nobody treats them the way you did to this group.